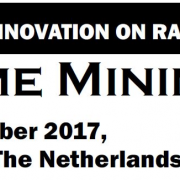 This autumn, UNEXMIN will be presented at the Real-Time Mining Conference, an international conference on innovation in raw materials extraction. Co-organised by the Real-Time Mining project and three other Horizon2020 raw materials projects, namely UNEXMIN, ¡VAMOS!, and SOLSA, the conference will be held in Amsterdam on the 10th and 11th of October this year. This event aims to bring together raw materials and robotics experts from various European-sponsored projects to exchange ideas and rise synergies on innovation in resource extraction. Opportunities to create new ideas for current European projects and for future collaborations are envisioned to arise from the meeting. The Real-Time Mining project is creating an innovative concept for predictions and measurements in mining operations. 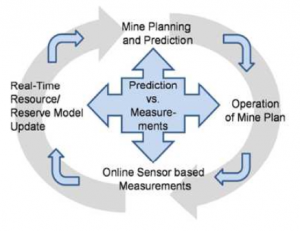 The key circular factors in this novel mining operational concept are 1) Mine Planning and Prediction, 2) Operation of the Mine Plan, 3) Online Sensor-Based Measurements and 4) Real-Time Resource/Reserve-Model Updating. These factors come together to realise of the vision of near-continuous process control and operational optimisation in mining activities. The real-time continuous closed-loop process, as proposed by the Real-Time Mining project. The main topics of the conference are Positioning and Material Tracking, Automated Material Characterisation, Resource Modelling, Process Optimisation, and Data Management. The conference will focus on these points, however there will be the opportunity for concept presentations on closely-related topics. The UNEXMIN consortium is glad to take part in this event, during which we will present our highly relevant technology concept – building an autonomous robotic explorer for the exploration and mapping of flooded mines. There is a call for abstracts (see the topics above) that will run until the end of April. For registration, abstract and paper submission (as well as other enquiries), please contact Dr. Mike Buxton – Phone: +31(0)152789674; E-mail: M.W.N.Buxton@tudelft.nl; Civil Engineering and Geosciences, TU Delft, Stevinweg 1 Delft. For more information, check out the Real-Time Mining website!